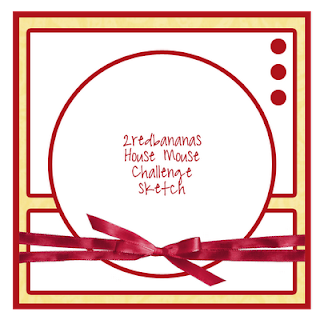 Cards by America: House Mouse Monday Challenge #25 - A 2RedBananas Sketch! House Mouse Monday Challenge #25 - A 2RedBananas Sketch! So I tried to keep it simple (not typical of me, LOL). My BG is flourish embossed (though not really visible here). The HM image is popped with foam dimensionals. This Stampabilities House Mouse Design image is called: "Paperclip Heart" HMOR1010. The Love Sentiment is also from Stampabilities-HMD. Images were colored in with Marvy LePlume Markers, CTMH Chalks and StarLite Glitter Gel Markers. Brown BG Paper is textured Bazzill CS and the Red CS is from Making Memories. The circles were cut with Creative Memories templates and scalloped circles with Nesting dies. These were pierced along edges and also popped with foam adhesive. Satin Brown Ribbon and 3 large silver heart brads complete my card. LOve it! Oh so darn cute! Great hm, awesome ribbon. Awesome card! Such a sweet card!! I love love love that ribbon too :) Thanks for letting us play in the challenge with y'all! This is a really awesome card. Your coloring is so good. I wish I had a steady enough hand to do something like that. I use watercolor pencils because they're so forgiving - I can just erase the mistakes - but I'm not brave enough to try markers. Gorgeous card - so vibrant and the colouring is stunning. Sooooo cute!! Love the red/chocolate combo and your delicious bow!!! Love this gf!!!! this is very lovely. This card feels very rich... kwim? love the dark red with the dark brown.... love your card and how you designed it all!! Lovely card! Love the 3 little hearts in the corners! OK...I've never seen that paper clip stamp! WAY CUTE! LOVE your card for the challenge. Dang...you ALWAYS make great stuff!! So cute! Love how you popped the image up. Oh wow, I love that sketch and your card is ADORABLE!!! This is just the SWEETEST! Oh, I love it so!! Thanks for stopping by my blog and leaving such a nice comment. I appreciate ALL of your comments, but today's was especially sweet. Thank you! This is adorable America. This card is complex for me and simple for you.. Love the colors. Great use of this layout. Super job. Thanks for letting us all tag along..
Love this card, it's sooo cute. I am always a bit intimidated by bold colours and don't think I have ever used any bright or bold colours on a card, but after seeing this I think that is about to change! !